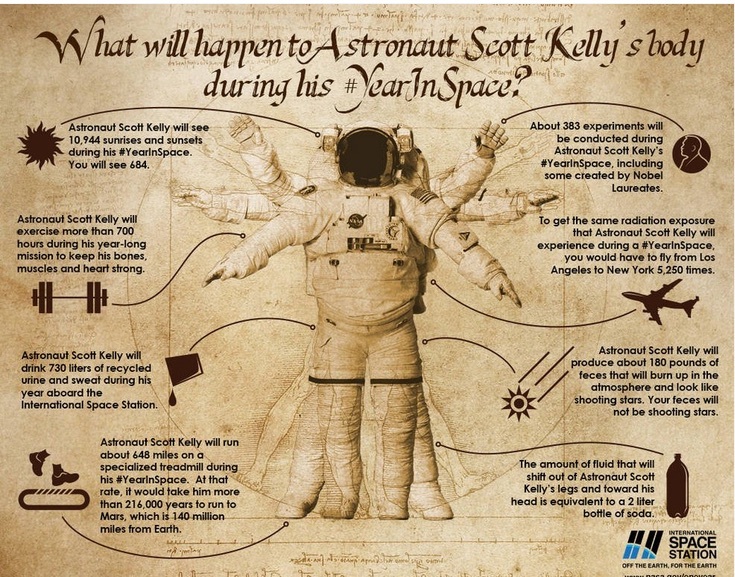 NASA, the American space agency, has released an informative infographic, detailing what will happen to astronaut Scott Kelly’s body while he spends a record 12 months in space. Kelly, along with Russian astronaut Mikhail Kornienko, reached the halfway point of their mission this week, prompting NASA to release the graphic in celebration of his milestone. The two men are to spend a total of 342 days on the International Space Station in order to explore the effects on a human body of spending an extended time in space. As part of the “Year in Space” program, Kelly’s twin brother, retired astronaut Mike Kelly who has stayed firmly on the earth, is being tested alongside samples periodically gathered from Scott. One of the long-term aims of the experiment is to determine if humans would be able to travel to Mars, which would take approximately 260 days when Earth is at it’s closest approach to the Red Planet. The round trip would take around two and a half years because of the need to wait for the right orbital window for the return journey. Among some of the more notable effects and events that Kelly will experience during his year in space include seeing almost 11,000 sunrises and sunsets—compared to the 684 we’ll see on Earth, and that as his discarded feces enter the atmosphere they’ll burn up and look like shooting stars.